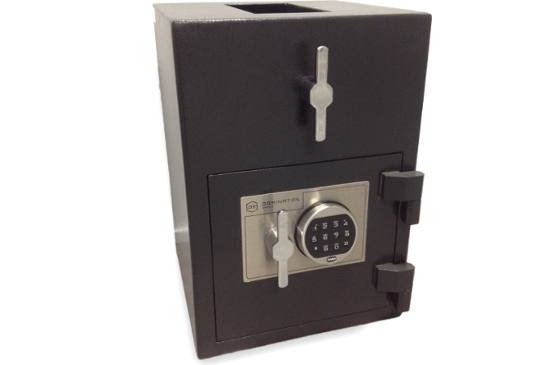 Using a unique top access rotating deposit shute, the TD Series deposit safes allow easy depositing, while making it very difficult to force open. Deposits are placed in the opening before turning the handle to transfer the deposit into the secure compartment below. Rotating deposit safes can be built into cabinets to allow deposits to be made through the counter top, making a clean and efficient installation. 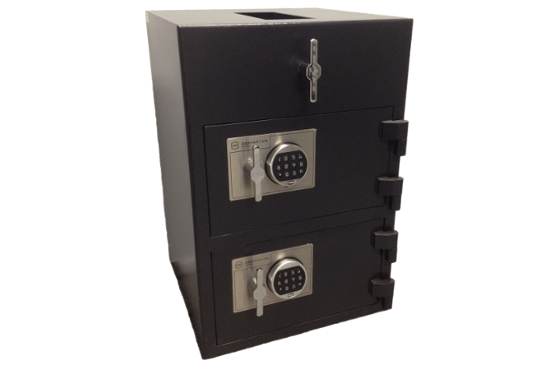 The TD-1 is a compact rotating deposit safes, made with high security body and door framing and easy deposit rotating chute configuration. The top mounted deposit chute restricts the ability to attack the safe by leverage or force attacks and can be neatly concealed inside point of sale cabinetry. The large sized TD-2 includes 2 separate compartments, each secured by high security locks, to allow the separation of cash deposits and change, for efficient use in retail applications. The rotating deposit chute allows deposits into the top compartment, allowing you to control access to cash when unique cash management is required.